Sala Thai is a local Thai restaurant chain that has three area restaurants. I've noticed lately that they've been offering a number of deals through Living Social/Groupon-type sites so I've been wondering how they've been doing. Located on U Street in the U Street Corridor, they have a prime location yet on this particular Saturday at noon, we were the only ones in the restaurant. We took a seat by the window and began looking at the menu. Like many Asian restaurants, they separate the vegetarian dishes from the meat dishes, but online they list them as "vegan" whereas in the restaurant, they are listed as "vegetarian." One of the best things about Sala Thai is that they do not use fish sauce in their Thai dishes so you can typically trust that the veggie dishes will be vegan. I always ask anyway just to be sure. 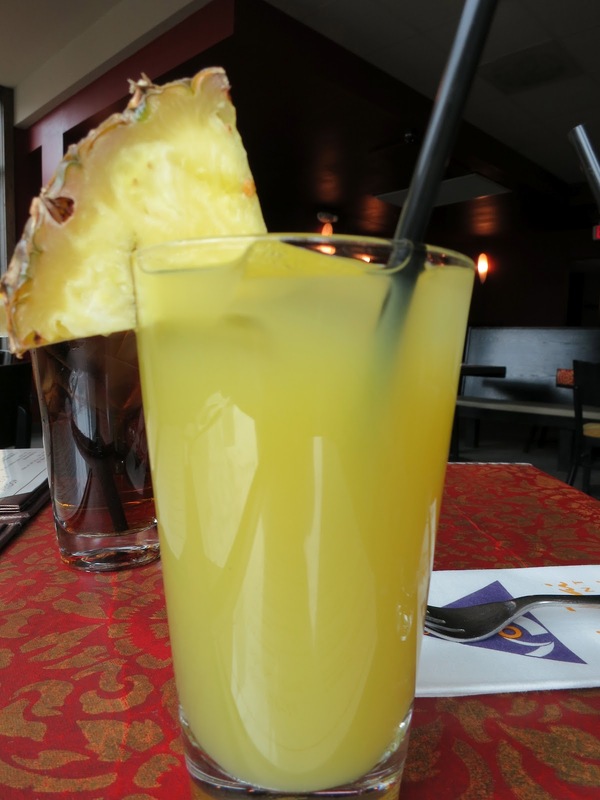 I started by ordering a pineapple juice and an appetizer. The pineapple juice was served with a slice of fresh pineapple -- very nice! The appetizer we ordered was the Tofu Tod, which is deep-fried tofu served with a sweet and sour peanut sauce. The little tofu bites were a little over-fried as the outside was a bit hard to bite into, but they were still soft and chewy on the inside. The fried texture paired well with the sweet and sour sauce. For my entree, I ordered the Ka Prow Tofu, which is fried tofu sauteed with veggies in a hot chili sauce. I love this dish because it is super spicy (3 peppers!) and the vegetables are always cooked just right. At other Thai restaurants, this dish is just tofu, but at Sala Thai, the tofu is served with broccoli, cabbage, carrots, and snow peas. Zach got the Kee Mao J or Drunken Noodles. I really liked this as well. The stir-fried flat noodles, fried tofu, and veggies were mixed with hot chili, basil, and garlic sauce. Lastly, we took an order of the tofu snow peas home with us for lunch the next day. This dish left a lot to be desired. It was mostly snow peas, hence the name, stir-fried with deep fried tofu (that's a lotta fried! ), some baby corn, and a couple of tomatoes in a light garlic sauce. The sauce was a bit too light and I wanted more of a variety of vegetables. When I looked at the menu, I noticed the dish was supposed to have mushrooms too, but they weren't in the dish. Sala Thai serves pretty decent food, but their popularity appears to be waning. Their prices are great at only $9.95 per entree and their service is acceptable. The food is cooked pretty quickly as well. I think it is a great lunch spot.